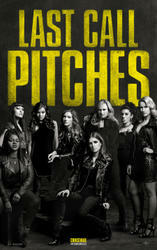 Pitch Perfect 3: Why Go? The squad gears op for #3! Here's why you should go. Fandango host, Jack Hind, want to become a Bella. Maybe stick to hosting, Jack. Looking for movie tickets? Enter your location to see which movie theaters are playing Pitch Perfect 3 near you.